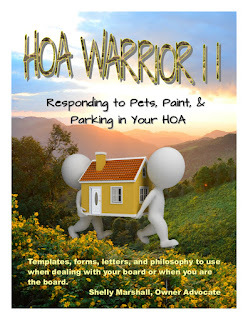 Fight for your rights lost in HOA-Land | HOA Constitutional Government: "Author and advocate Shelly Marshall joins a number of other homeowner rights advocates challenging the misinformation about the real lives of HOA members: Jill Schweitzer (Buying into an HOA with your eyes wide open! ), Ward Lucas (Neighbors at War! ), Sara Benson (Escaping Condo Jail), and yours truly, George K Staropoli (HOA Common Sense: rejecting private government). There is also extensive material from Deborah Goonan on internet blogs." Read the full review of Shelly's book here..